If you’re a lover of patchwork quilts, you’ll really enjoy our Amish Sampler quilt. 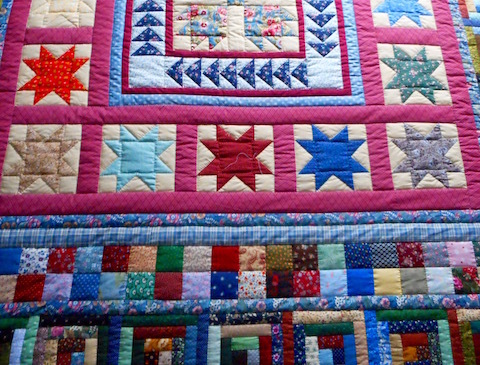 Quite literally a sampling of traditional quilt patterns, the maker included a Bear Paw pattern at the quilt’s center followed by Flying Geese patterns, then Snowflakes and finally Log Cabins. Calico fabrics are a mix of earthy shades and jewel tones. Every element of every pattern is hand quilted.